Former U.S. President Bill Clinton and his wife, former Secretary of State Hillary Clinton traveled to the summit of Maunakea in early January 2018 and learned about the cultural, natural and scientific significance of the mountain. The Clintons were shown culturally and geologically important sites before touring the W. M. Keck Observatory, one of the largest and most scientifically important optical/infrared telescopes in the world. 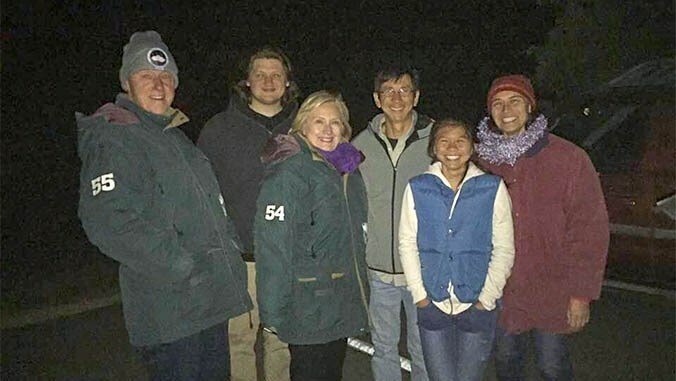 After watching the sunset from Hawai’i’s highest peak at nearly 14,000 feet, the Clintons returned to Halepōhaku at the 9,200 foot elevation for stargazing. The University of Hawaiʻi at Hilo’s Department of Physics and Astronomy set up two, 9.25-inch telescopes, one with an attached camera capturing images viewed through the telescope. The Clintons were in awe during the 90 minutes of viewing the overwhelming number of stars that can be seen from Maunakea. “We showed them the Orion nebula, Pleiades open cluster and Andromeda galaxy, and towards the end, Mrs. Clinton chose a couple of objects and moved the telescope herself,” said Marianne Takamiya, UH Institute for Astronomy astronomer Mark Chun, Waiākea High School senior Alicia Chun and UH Hilo astronomy student Mitchel Rudisel. 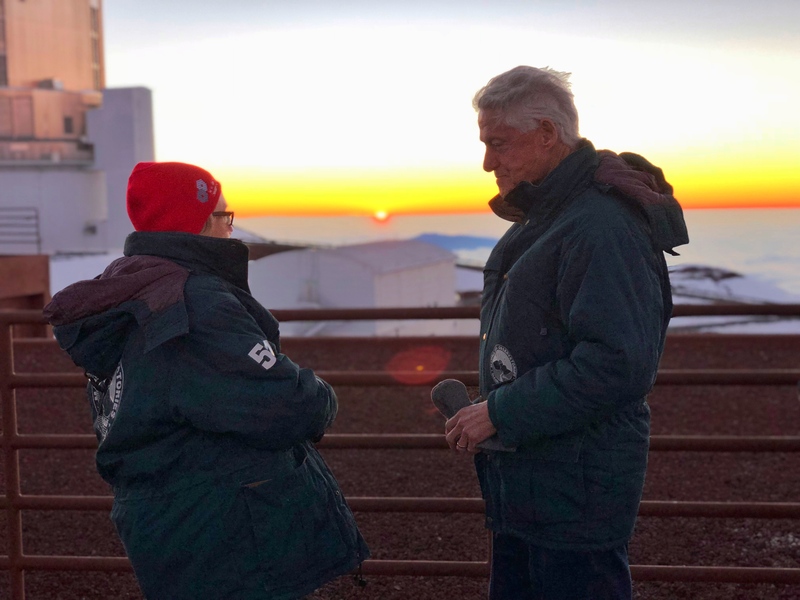 “Getting to show the Clintons different nebula and galaxies while sitting below one of the darkest skies in the world was an unforgettable experience,” said Rudisel. From left to right: Maunakea Ranger Tommy Waltjen, former President Bill Clinton, Maunakea Support Services General Manager Stewart Hunter, former University of Hawaiʻi Institute for Astronomy Director Guenther Hasinger, former Secretary of State Hillary Clinton, Chief Maunakea Ranger Scotty Paiva (in back), Office of Maunakea Management Director Stephanie Nagata. The Clintons learned why Maunakea is the best site in the world for astronomy and why it is the center for astronomy in the United States. 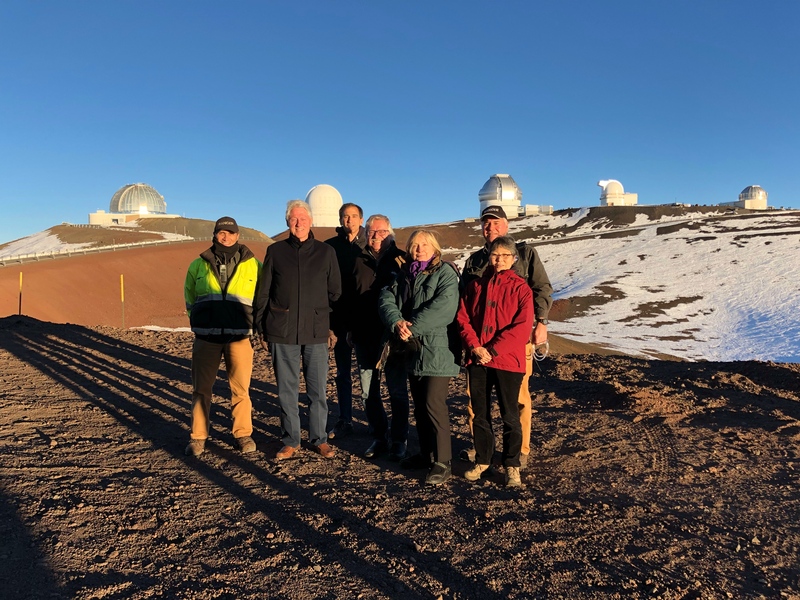 They also learned how the observatories on Maunakea use their different scientific capabilities and collaborate to make some of the most significant discoveries. The Clintons were also told the history of astronomy on Maunakea and how UH was not only tasked to pursue astronomy, making it the world’s premiere program, but of its responsibility and commitment to protect the mountain resources, according to Office of Maunakea Management Director Stephanie Nagata.